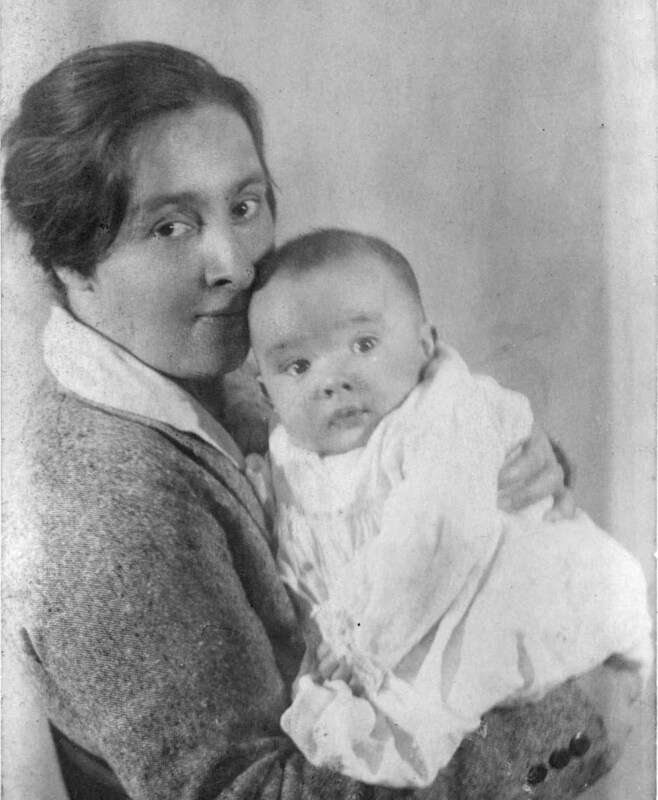 Thomasine (Roberts) Clarke with infant, probably Gregory Clarke. Thomasine Roberts was born on 24th May 1890 in Perranporth, Cornwall, the daughter of William Roberts, a mining 'captain', and his wife Annie Matilda Roberts née Stephens. Thomasine Roberts was said to have been educated partly in Truro. The High School there was founded in the late nineteenth century when its intake was primarily female. Thomasine left Perranporth, apparently without her father's approval, to train in Westminster as a short-hand typist. During this period she lived in shared accommodation at the newly-built Hopkinson House Ladies Club. By 1915 she was employed by the London and Counties Bank in Westminster, whose customers included Alexander South Clarke: her future husband. Thomasine Roberts was married at the church of St. Mary in Westminster (closed 1923) on 18th September 1920 to Alexander South Clarke - a motor mechanic, the son of Richard John Clarke, deceased, a former civil servant. Witnesses present were Elizabeth Anne Clarke, his mother, William Welham Clarke, brother of Alexander, and Norma Thomas, née Roberts, the sister of Thomasine. Thomasine Clarke died on 18th May 1964 at Warlingham Park Hospital, in South London from circulatory failure. Last modified: 2013 September 12th.